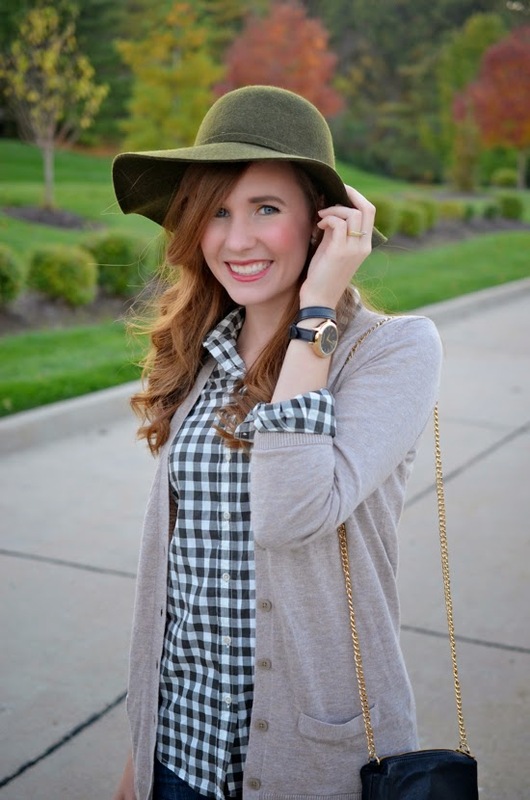 some gingham, a linkup & a giveaway! I'm excited to be giving away your choice of watch from Wristology, just enter in the rafflecopter below. In other news, we officially signed our lease! I can't wait to start tearing down wall paper, painting, and moving into our own place soon. Plenty of 'before' pictures to come, and hopefully it won't be too long until the 'after' photos. Yeah! Love your floppy hat - the moss green is so pretty! Your hat is super cute! 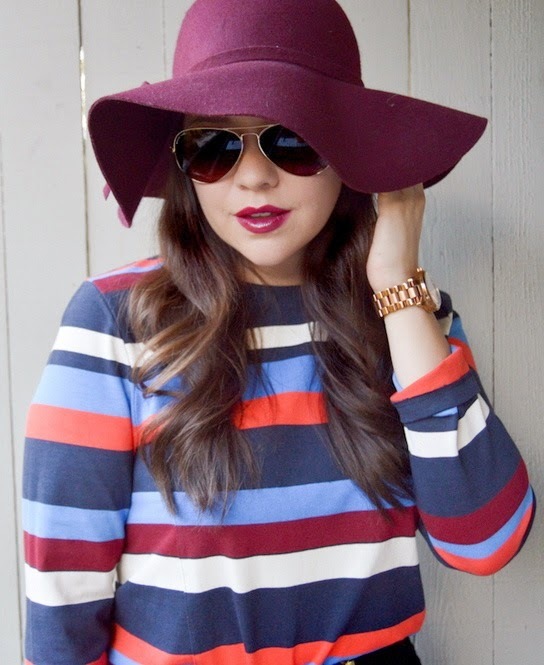 I love fall hats that are big and floppy, but also keep you warm! Great look. This outfit is so cute and the hat is a great touch. You look adorable. You look so cute in that hat! Love it! Ooooo .... I'm a favorite! So thrilled, especially because I'm just in love with your style, Girl. Pinned this outfit too. FABULOUS. Super cute look, babe! And what an awesome giveaway- I love the black + gold Macy watch! I absolutely love this outfit! It's so pulled together and would be great for so many occasions. And I would pick the brown Macy as my fav! That hat is so fab! I haven't seen an olive colored hat like that before- great choice and very flattering on you. Your whole outfit is so cute and the scenery you chose for these photos is sooo picturesque! Such a great hat! I love the color and it's the perfect accessory for fall! I would pick the Rachel in Gold! 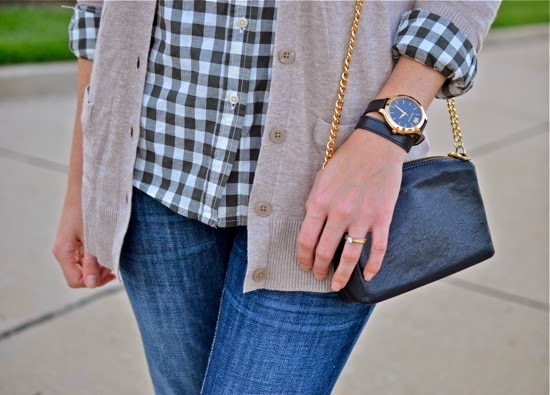 I just love the checkered shirt under the cardigan, and those shoes are adorable! Count me in as in love with that floppy hat & all the layering you did!! You always look great in casual Fall Outfits especially those featuring some kind of plaid/gingham and one of your cute hats. Your 3 top picks look awesome also. Pleasure linking up again Jenna Marie. Oh and awesome giveaway also. I'd pick the Alex in the Rose Gold. Love it. I love your layers here! Such a great look! Lovely fall outfit! You look great with the hat! That hat looks amazing on you! I love it with this look! I love the burches. I have the black ones with the bigger burch on it. I'm thinking of getting the smaller ones though-- I have kinda worn through my black ones lol. PS love that flat watch, I have been wanting one forever. I would pick the watch you are wearing in this post!!! it is so cute! I would pick the Rachel in gold. and I'm so jealous that you look cute in hats! they never seem to fit my face/head right! I wish I looked as good as you in that hat. Hats and I just don't get along. I really love the MADISON ROSE GOLD! I love the Macy in gold and black that you have on! And this outfit is perfection!! Love everything about it! Torn between the Macy and Rachel! I absolutely love love love your outfit! Yet another darling look! Love it! Thanks for sharing with Three-fer Thursday! what an adorable and perfect fall look - pinning for sure! I really like this outfit, but what makes it perfect for me is the watch! It's such a nice detail. I love the Alex in rose gold! Yay!! Can't wait to see the progress pics! So much fun! You are stinking cute in this hat! I really want a leather band watch! Love your look! I just found your blog, and I'm your newest follower! So, so cute! I love your hat! Perfect shoes! Love the whole look. This is such an effortlessly chic outfit, and so perfect for fall! Love everything about it, from the distressed denim, to the layers, to the over all shape. I love the Alex watch in tortoise! Thanks for such great outfit inspiration as well as a great giveaway! I love Alex Tortoise and Rachel Gold with Pink Face!! You always look amazing! I love your blog! I love the alex tortoise! Yayyyyyyyy! I can't believe I won! !! Thank you so much! Those jeans are so absolutely great looking on you.